This is a detailed review of the Fez Vaporizer. 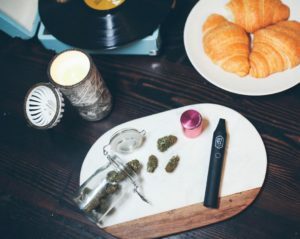 We have received this fantastic vape, courtesy of Smoke Cartel, in order to provide our unbiased and honest review of the Fez Dry Herb Vaporizer. Watch this quick video review! 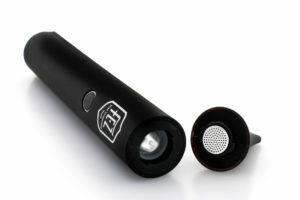 The Fez Vaporizer is unlike any other vaporizer we have used before. The creators of Fez have designed the masterpiece of dry herb vaping. This device has left myself, and many friends, completely satisfied. The first thing you notice as you pick up the Fez is the sleek quality design and the soft pleasant feeling of the material. Right away you can tell this device was built of quality. 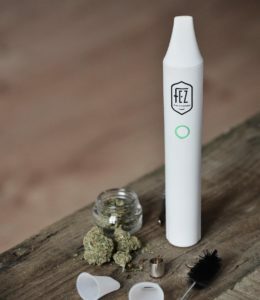 The Fez device will allow you to vape dry herb as well as your oils. With each puff you will be completely lost in the vibrant tastes. The Fez is a SMART vape that will automatically go to sleep when you stop using it. It also has three heating modes that you can experiment with. Cleaning the vape is pretty simple but may require more patients when vaping oils. 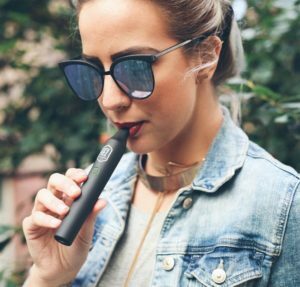 The simplicity of the device allows you to vape when it is best suited to your needs. In recent sessions, the Fez Vape was a huge hit delivering satisfying smooth hits. The Fez device is built with a gray, soft to the touch, material that allows it to be lightweight and concealable. The vape weights less than a typical smartphone and can be handled comfortably. On the front of the fez there is a beautiful ‘Fez’ logo design that provides the finesse touch. In the center of the device, there is one button surrounded with the mode indicator light. The light around the button allows you to be aware of the mode you are in, your battery levels, as well as alert you when the device is in sleep mode. The top mouthpiece disconnects from the vape with just a small twist and pull. The mouthpiece goes back on very snug and creates a good seal. Unfortunately, after periodic use, you will need to buy a new mouthpiece because they tend to get clogged. Inside the Fez vape is a large dry herb chamber that can hold plenty of dry herbs. Fez also comes with a cannabis oil accessory that allows the vaping of your oils inside the dry herb chamber. At the back of the device there is a green warning label ‘HOT’ that will alert those who want to take a puff. The Fez is made out of scratch resistant material that feels good to the touch. The plastic is very durable and can take multiple dings and drops. The simple pen design allows for discreet portability. 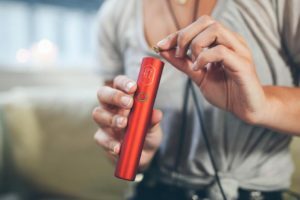 The compact design allows you to take this vape anywhere you wish. The quality and well built design of the Fez vape allows it to dissipate heat very well. You can use this device, for as long as the battery allows you, without the fear of burning yourself. 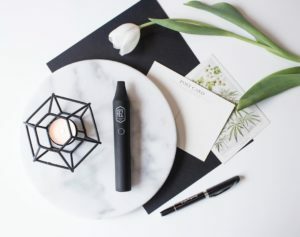 Unlike most dry herb vaporizers, this device has no excessive ‘plastic out-of-the-factory’ smell that could alter the flavor of your herbs. Every Fez Vaporizer comes with a one year warranty. If your Fez has a defect, or an internal problem, you may send your device back and receive cash, credit, or a whole new device. With your vape you receive a cleaning pipette, handful of silicone protectors, dab pick, wax container, as well as the oil attachment. The Fez, on average, takes 2 to 3 hours to reach a full charge. The micro USB charger fits tightly in its designated port. The Fez Vape comes with its own charger, made of durable hard plastic, as well as a charging cable. The short charging cable provided is disappointing but since you cannot use the device while it is charging it is not a big problem. When you plug the Fez to charge an orange indicator light will light up letting you know the battery is charging. When the light turns green the device is fully charged. With each full charge the Fez Vape can deliver up to 2000 puffs at low temperature mode. At high temperature mode the Fez will deliver roughly 800 puffs. This ensures your vape to last over three days of constant use. 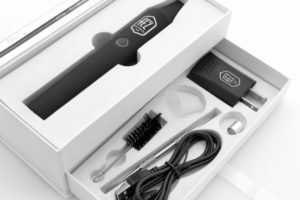 This is a SMART vaporizer that comes with multiple modes and safety features. The sleep-mode feature is enabled when the indicator light is flashing blue. This will prevent the overheating of the device as well as prevent damage to your precious herbs. It will automatically be enabled after the device has been sitting still for a certain amount of time. It is very easy to wake up your device from sleeping mode. All you have to do is either move the device or press the center button. The overall auto shut off feature is very convenient and ensures your dry herbs won’t get burned. A really cool feature of the smart Fez Vape is the ability to shake the vape when you want to check the battery level. You may shake the device whenever you want to check the power and the indicator light will flash either green (full power), orange (medium power), or red (low power). This handy feature allows you to tailor your usage according to the power level of the battery. Another feature is the three temperature settings that are available for you to use. Double-click the center button and the new light color will indicate the preset temperature of either green (low temperature), orange (medium temperature), or red (high temperature). This awesome feature allows you to instantly change the temperature of your device any moment you feel like it. Holding the center button for two seconds will turn the Fez vaporizer on and off. The mouthpiece is very comfortable to use. It has a nice feel to it that provides comfort when vaping your herbs. The Fez comes with silicone mouthpiece covers. You do not need a lot of suction when hitting the vape. The vapors will be warm to hot depending on the mode. The device works a lot better after you have used it for at least five minutes. It may take a while to produce vapor when vaping your oils! The vapor produced by Fez is hardly visible but don’t let that fool you. Overall we are very satisfied with the drags that this vape provides. The Fez vaporizer gets the job done unlike any other vaporizers we have tried. The Fez allows you to really have a taste of your herbs as well as deliver an experience unlike any. When vaping your dry herbs, you will be accompanied with aroma of sweet scents. The smell dissipates very fast especially if you are outside. 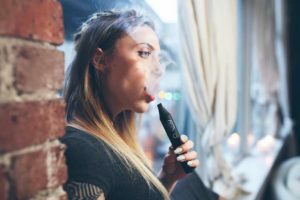 After you are done vaping your buds you will notice that the device will not smell such as a combustible dry herb vape. Be warned with long drags you can be left with coughing up a few lungs. 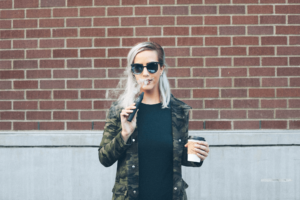 Vaping has its own additional medicinal benefits. When medicated after vaping you will be completely relaxed, have focus abilities, no heavy body load, as well as a pleasant state of mind. You will be able to carry conversations and be moderately sedated. When vaping your oil’s you will smell a very sweet and identifiable smell. The smell is very powerful so it is best to vape in discreet if possible. The sweet taste that you get with Fez cannot be compared to any vape on the market. Oils have very powerful medicinal value. You will be in a state of complete relaxation with very good focus abilities, satisfying body load, and a powerful sedated mind. Cleaning up the Fez vape is very simple, quick, and easy. 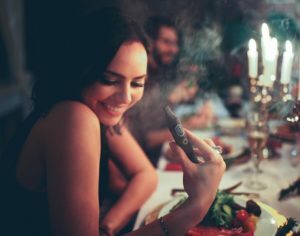 To clean up after dry herb vaping, you turn the device upside down and tap at the edge of the table. All of the vaped content (already vaped bud) can then be saved or tossed aside. Cleaning the fez after vaping oils is slightly messy. The oil will leave a sticky mess inside the chamber. Often times the oil attachment provided with the device will stick to the inside. You will need a tool to take it out. Next you will use alcohol and Qtips to clean out the oils inside the chamber. You want to clean the mouthpiece with soap and water to ensure that no residue is left inside. You cannot use alcohol on the mouthpiece or on the outside of your device because it will deteriorate the material. You can use a metal brush to push in the mouthpiece holes if they get clogged. It is recommended you clean your Fez device after every use.